If your Montana fly fishing trip will be your first, you will need to know some basic techniques in order to enjoy this unique and relaxing sport. 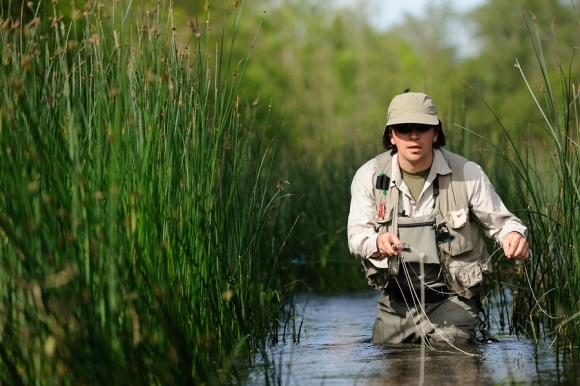 One of the most essential is wading, since the best fly fishing requires you to stand in the middle of a stream or river in order to cast your line. Bringing a wading staff along can help you keep your balance and stay sure-footed when venturing out into unfamiliar territory. For your first fly fishing trip, you should avoid wading into deeper waters, since your increased buoyancy makes it more difficult to control your movements. On later fly fishing vacations, you can venture into waist and even chest-deep water, but for your first trip you shouldn’t wade into water much deeper than thigh height. Of course, make sure you have a pair of new waders as part of your fly fishing gear collection—you can sometimes stand in the same river or stream for hours, and you want to be sure to stay dry and comfortable.